Acoustic Doppler Current Profiler (ADCP) subsurface mooring being deployed in the Bering Sea from the NOAA Ship Oscar Dyson. This weekend, the EcoFOCI program completed its eleventh and final research cruise of its field season on the F/V Aquila to maintain and enhance an innovative array of biophysical moorings in conjunction with annual ship-based hydrographic data in the Bering Sea. The team recovered 14 and deployed 10 moorings, including swapping the M2-site surface mooring for a sub-surface mooring to prevent damage from the ice to ensure 25 years of nearly continuous data. Scientists from PMEL, NOAA Fisheries Alaska Science Center and University of New Hampshire also collected some measurements from a CTD (conductivity-temperature-depth), nutrients, oxygen, plankton and larval fish along the Distributed Biological Observatory (DBO) Line 1, which has only been sampled once in 2017. 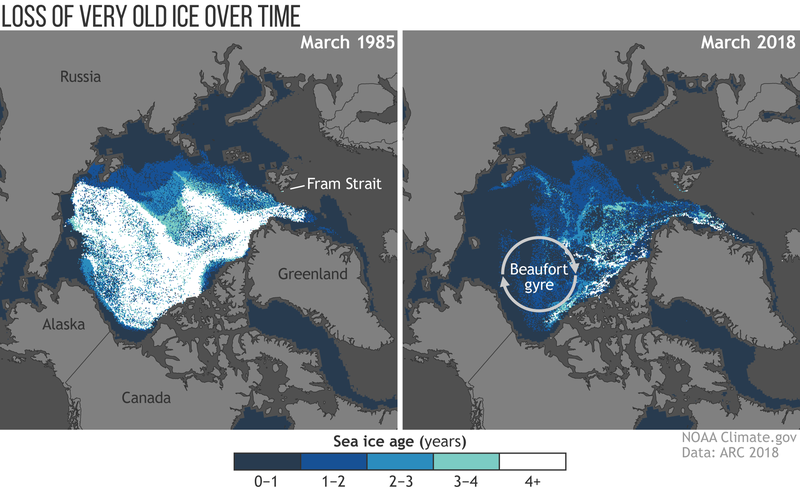 These DBO lines are designated “hot spots” centered on locations of high productivity, biodiversity and rates of biological change in the Bering, Chukchi, and Beaufort seas. Results from these observations and experiments will help describe important ecosystem linkages among climate, plankton, fishes, birds and mammals. Continuous monitoring from this region provides critical data to support sustainable management of living resources in the Bering Sea. The EcoFOCI program is a collaborative research effort by scientists at the Pacific Marine Environmental Lab (PMEL) and Alaska Fisheries Science Center (AFSC) focusing on the unique and economically important high-latitude ecosystems of Alaska. 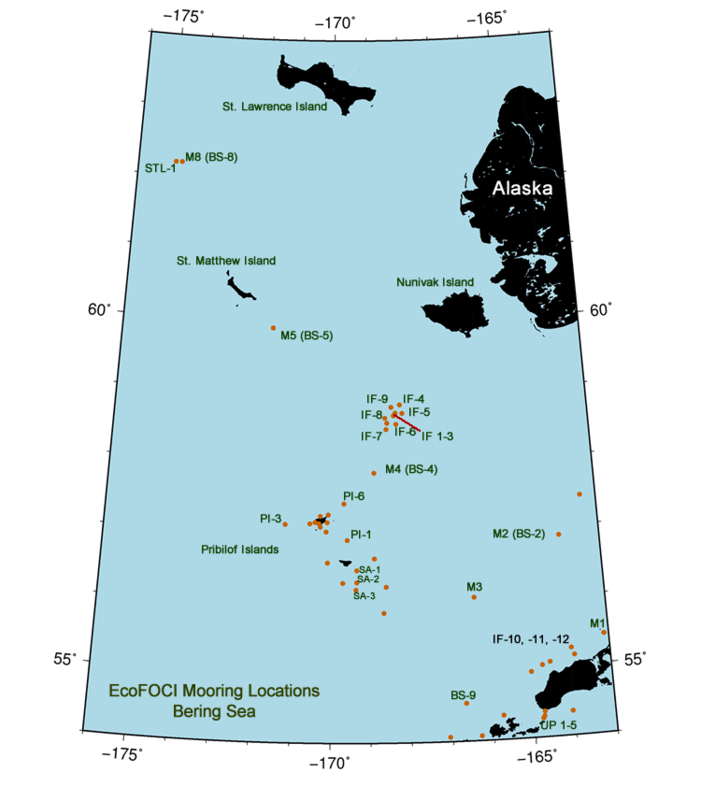 The EcoFOCI spring mooring cruise departed on Earth Day, April 22, from Kodiak, AK to service a biophysical mooring array in the Bering Sea, including M2. This is one of 11 research cruises the program will participate in from March-October. Aboard the NOAA research ship Oscar Dyson, scientists from PMEL, JISAO and AFSC are in Alaskan waters to retrieve and redeploy moorings, collect CTD (conductivity-temperature-depth) and other data. Peter Proctor from PMEL/JISAO is the Chief Scientist on the cruise and Geoff Lebon is the lead mooring scientist. 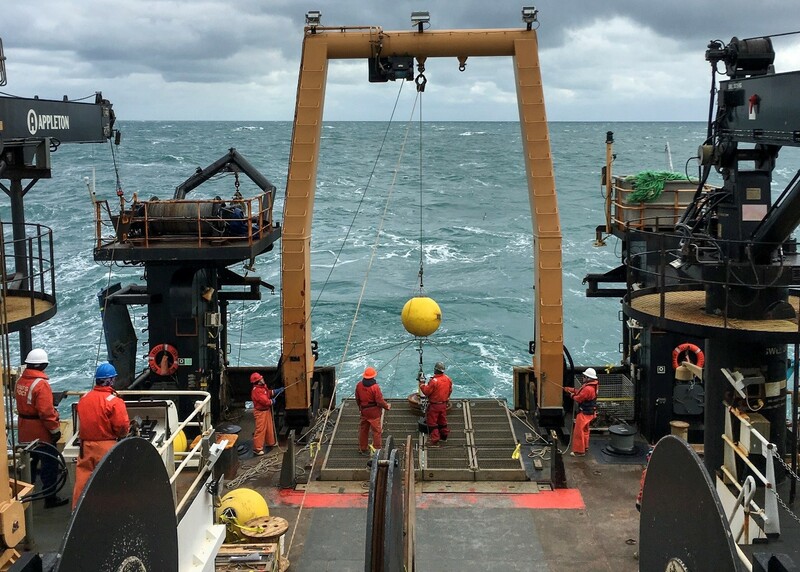 The M2 mooring has been deployed in the southeastern Bering Sea for over 20 years and has been providing year-round measurements of temperature, salinity, nitrite, chlorophyll, and currents in this highly productive area. Long-term time-series at this site are a critical tool for adapting to climate change and guiding sustainable management of living resources in the Bering Sea. 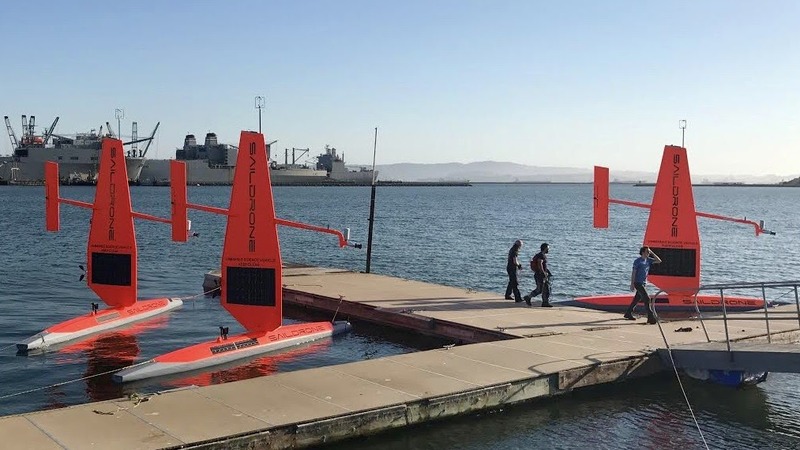 EcoFOCI will also be field testing and using several technologies in collaboration with PMEL’s Innovative Technology for Arctic Exploration program; including the Prawler, Oculus and Acrobat Towed Vehicle. These technologies enhance shipboard and mooring research with more data collection over a fine scale region. The EcoFOCI program is a collaborative research effort by scientists at the Pacific Marine Environmental Lab (PMEL) and Alaska Fisheries Science Center (AFSC) focusing on the unique and economically important high-latitude ecosystems of Alaska. Learn more about the program here. NOAA Fisheries and its partners, including the Pacific Marine Environmental Laboratory, released Regional Action Plans (RAPs) on December 16th, to guide implementation of the NOAA Fisheries Climate Science Strategy in each region (Northeast, Southeast, Gulf of Mexico, Alaska, Western, Pacific Islands). Ecosystems and Fisheries Oceanography Coordinated Investigations (EcoFOCI) program lead Phyllis Stabeno (PMEL) and Janet Duffy-Anderson (AFSC) were co-authors on the Alaska Regional Report. The Alaska Fisheries Science Center and the Pacific Marine Environmental Laboratory have the scientific infrastructure needed to produce the analyses and deliver benchmarks for the eastern Bering Sea. This Regional Action Plan identifies key actions to address priority information needs over the next five years to better understand, prepare for and respond to climate changes in the Bering Sea ecosystem. 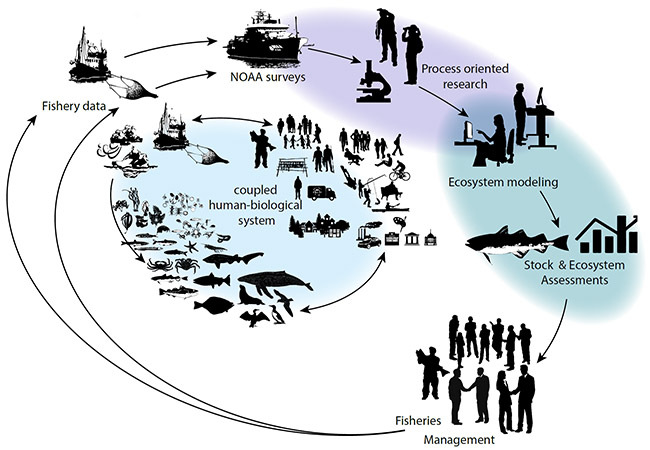 The Regional Action Plan, part of the NOAA Fisheries Climate Science Strategy, focuses on seven science objectives. Alaska's fisheries are worth $1.8 billion and are vital to local economies and our country's food supply. Alaska is also at the front lines of a changing marine environment. To protect and maintain the region's resources, fishermen, lawmakers and other decision-makers need information to respond to these changes and protect livelihoods and traditional cultures.The Regional Action Plan will help Alaskan communities, commercial and recreational fishermen and others who are dependent on Alaskan marine resources respond and adapt to changes that may be ahead in response to a changing climate and help ensure the sustainability of these marine resources. Read the full report in the NOAA Fisheries scientific publication, Technical Memorandum. Learn about Regional Action Plans from across the country, here. 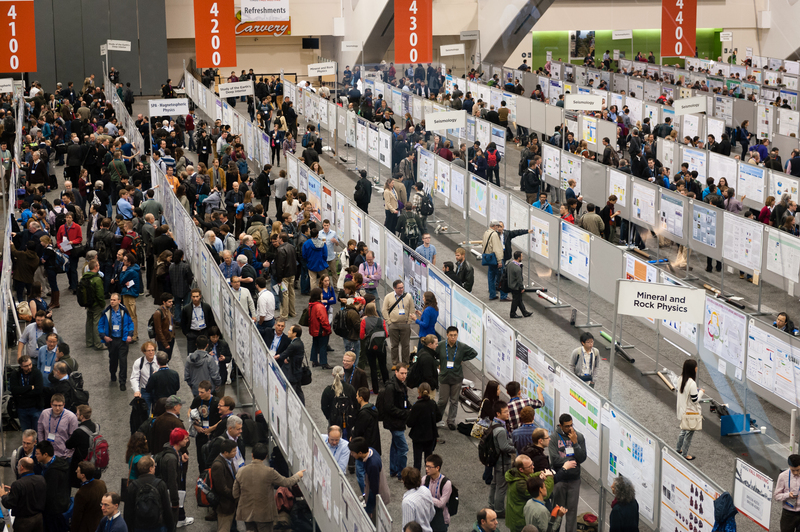 PMEL scientists, including scientists from the University of Washington's Joint Institute for the Study of the Ocean and Atmosphere (JISAO) and Oregon State University's Cooperative Institute for Marine Resources Studies (CIMRS) are attending the American Geophysical Union (AGU)’s Annual Meeting in San Francisco this week, December 12-16. 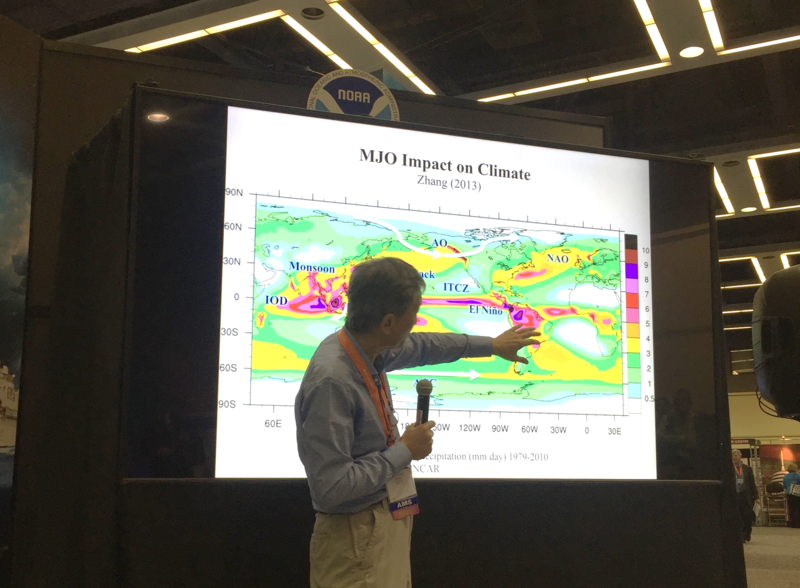 AGU's Falling Meeting is the largest Earth and space science meeting in the world bringing together the Earth and space science community for discussions of emerging trends and the latest research. 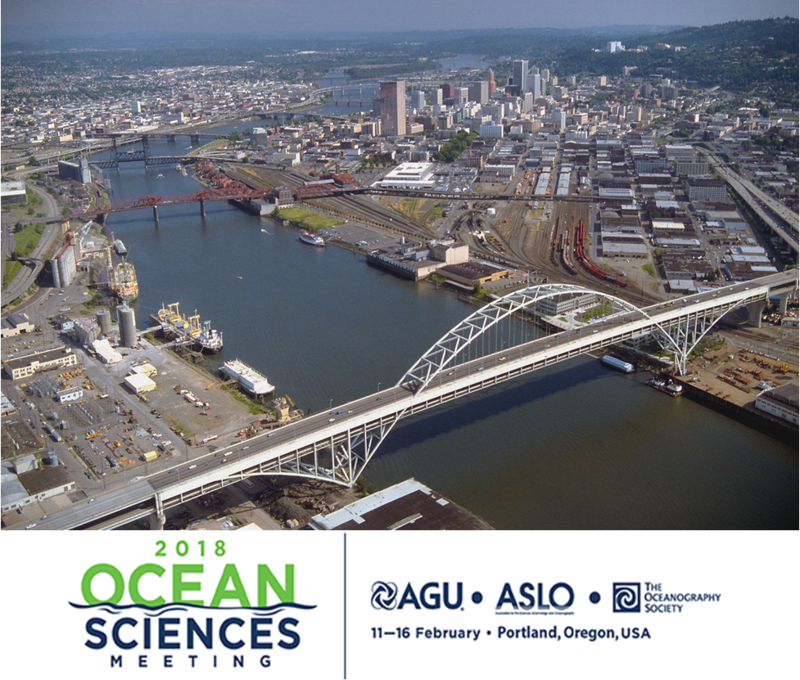 Poster and talk topics include data integration, El Nino Southern Oscillation (ENSO), Indian Ocean temperature trends, hydrothermal plumes and vents, carbon dioxide in the tropics and Gulf of Alaska, aerosol research, and heat impacts on marine ecosystems and fisheries, tsunamis, and acoustic research. The 2016 Arctic Report Card will be released Tuesday morning in conjunction with a press conference led by NOAA’s Jeremy Mathis. The 2016 Arctic Report Card brings together the work of 61 scientists from 11 nations to provide the latest information on multiple measures of Arctic environmental change, including air and sea surface temperature, sea ice, snow cover, vegetation, wildlife, and plankton abundance. Read the full report and highlights here as well as the press release. Watch the recorded press conference here. Researchers will also present during a press conference Thursday morning some of the first scientific results from the 2015 Axial Seamount eruption including discoveries of previously unknown structures and new glimpses into the volcano’s internal plumbing. These new insights into the world’s most active and well-studied underwater volcano may help scientists better understand all volcanoes and the hazards they pose. Read the press release here. Watched the recorded press conference here. Dr. Bob Embley from the Earth-Ocean Interactions group will be honored during the Awards Ceremony as part of the 2016 class of Fellows for his pioneering contributions to the understanding of deep-sea volcanism by fostering interdisciplinary investigations with advanced technologies.